Photo is representative of a Square Foot Garden - not mine! ~For a general vegetable gardening primer with the basics for your vegetable garden site, soil fertility, garden tools and buying plants, click here. 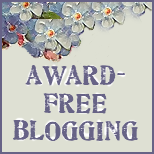 ~For my site selection dilemma and a little bit of inspiration, click here. ~And more about the importance of site selection, click here. I'm trying the All New Square Foot Gardening method this year because it puts more garden in a smaller space. And I'm curious to see if it will work down here in the deep south with our heat and humidity. 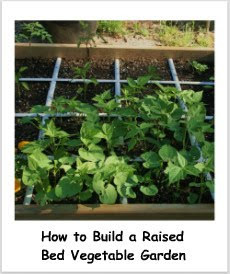 Even if you decide you don't want to go with the square foot gardening method, you can still use these basics to build a raised garden using standard rows. So, now... let's get busy putting together a raised vegetable garden, square foot style! Of course to start off, you'll need wood. I started off doing two 4' x 4' beds and later decided to add a 4' x 8' bed, but here I'll focus on the work on the 4 x 4 beds, just to avoid confusion. Mel (the author and originator of square foot gardening) recommends using either 1" x 6" or 2" x 6" wood (meaning 1 or 2 inches thick x 6 inches wide), but the 2 x 6 stack was way up in the rafters at Lowe's and we didn't want to wait, so we purchased the 2 x 8 instead. A 1-by is fine and is a little less expensive than a 2-by but a 2-by is going to be a more sturdy box. The only difference is that once you set your boards, that 6" is going to be the exact depth that your soil needs to be, so that the soil will come to the top of your raised bed, which is the most desirable. If you are using 8" width like I did, you'll either need to contend with your soil being lower, or fill up your bed with more soil, meaning more cost is involved. You can also place a layer of sand in the bottom of your raised bed instead, but will need to be careful not to dig into it and turn it onto the top of your soil. More on soil later! Most wood is going to start at 8 feet long and go up from there in length, so we picked up four 8 foot sections of pine, 2" x 8" (2 inches thick, 8 inches wide and 8 feet long.) Since I'm doing the 4 x 4 beds, I had them cut all of the pieces in half right there at the store. Those are pieces are lathe wood for the grids - more about that later also! You will need a drill and some deck screws - about twice as long as your wood is thick. So if you are using 1" x 6" or 1" x 8" boards, use 2 to 2-1/2" deck screws. For 2 x 6 or 2 x 8, go for 3 to 3-1/2 " long, 1/4 inch deck screws. Hubs used a 1/8" drill bit 3" inches in length and a #2 Phillips head power bit for the screws. Stack your wood pieces up on top of each other on a flat surface, such as a concrete patio, and then line them up so that they are staggered like this. When you drill the first set of holes, slide the top board back just enough to expose the next board and continue this until you've drilled all the boards. This way you'll always have a board to use as a guide for the one underneath it. You are gonna drill 3 pilot holes in each board like this. Well, except Hubs got a bit too close to the edge on that one hole in this shot and probably had to re-drill that one. So whatever thickness wood you are working with, whether it is 1" or 2", place your holes about halfway of that in from the edge. You only need to drill 3 holes in each piece of wood on one end only, not on both ends. When you set up your boards, stagger the ends on each corner to help square it up better. See the board in the bottom of this photo how on the lower left hand edge of the picture the wood is on the outside of the board and on the upper right hand side of the photo, that edge is on the inside of the other board? You'll alternate this the same way, all the way around. This keeps your bed square, but you will overall lose about an inch in space I learned. Now all you do is set up all your boards and use the drill to insert the screws through the pilot holes and into the end of the adjacent board. Do all four corners, and your box is done! Take it to the site you have selected and set it in place. Remove all the grass and weeds that are in the area underneath. I considered skipping that step since we're gonna place landscaping fabric in the bottom of our box, but when I checked the book , it told me to remove the grass and weeds anyway. So I listened and did it. It'd be just my luck to have break through weeds! I just used this bow rake, cultivator and my new kneeling stool (I can't believe I haven't bought one of these before!) and it really wasn't hard at all. You'll need the level (if you have one) in a second. Now that the base is cleaned out, we're gonna make sure that it is fairly level. Level it out the best that you can by using a shovel to shift some of the underlying dirt around. You can pretty much tell where dirt needs to be removed and placed just by looking. In my opinion it doesn't have to be perfect so long as it is close to being level. You can see on my level the bubble is just off to the left a bit, but that's okay. It doesn't have to be perfect for me - I just don't want it to be obviously slanted! If you don't have a level, just eyeball it the best you can. Next, we'll be laying out some landscaping (weed control) fabric. UPDATE 2010 - I have found in my Year 2 Square Foot Garden to have multiple break through weeds - and I mean MULTIPLE, which means more weeding, ugh! So my advice here, is to lay down several layers of landscape fabric. I don't know whether this will resolve the breakthrough problems, but I can't see how it wouldn't at least reduce them. Sure wish I would have known, but now you can learn from me! Get somebody to hold your box frame up for you without moving it and roll the weed control fabric out, cut it but leave some edge on the outside. Then carefully drop the box back into place. Now your boxes are done! Supplies for EACH 4' x 4' box: IMPORTANT! 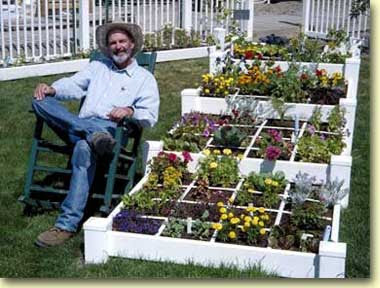 After several years of doing these gardens, if you live in the south where extreme heat is an issue, I recommend doubling the boxes so that you can stack one on the other and make these beds twice the height. I'm upgrading mine to that depth this year. To attach the boxes, I'll be putting a 1 by 1-inch pine stake into each corner to use to nail the stacked boxes together to brace them. *Drill bits - 1/8" drill bit 3" long for the holes; a #2 Phillips head power bit for the screws. Also the video version is very good, but with less info than the book. 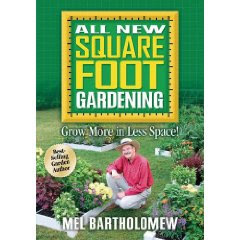 I don't know how you could really do square foot gardening without the book to be honest - had no idea there was a video! Thanks for stopping by. If you don't like pulling the weeds, you can lay down a thick layer of wet newspaper to kill anything underneath. It will eventually biodegrade. very helpful article! pictures are great and you break down the steps well. Thanks!